I know it’s a Tuesday evening but I’m bored and that’s about it. Pedro Astacio started his career out in the West Coast with the Dodgers, coming up in ’92 and starting 11 games with 1.98 ERA and a 5-5 record over 82.0 innings to kick off his career. Next year, he went 14-9 in his first full season over 31 starts and was destined for success… or so we were lead to believe. After spending 6 years with the Dodgers, 5 with the Rockies and half of a season with the Astros, the Mets got a hold of the righty for two seasons, one of them only being effective. In 2002, the Mets went all in. They acquired Mo Vaughn, Roger Cedeno, and even future Hall of Famer Roberto Alomar. They then signed Astacio to a one year deal worth $5M to join roster of pitchers alongside the likes Al Leiter and Steve Trachsel. That season Astacio went 12-11 with the Mets pitching 191.2 innings and giving up 32 home runs, while also striking out 152 to go with his 4.79 ERA. His second season was pretty much a wash only starting 7 games, going 3-2 with a 7.36 ERA over 36.2 innings. However, this would be the last time we would see Astacio in a Mets uniform. While the signing overall may be viewed as a failure, I stood and stand behind it. Astacio did give up a lot of home runs but I do remember him coming up in some clutch situations. I do also remember him being a good fit in the clubhouse with the other newly acquired veterans as well as being able to drop a nasty deuce when the team needed. 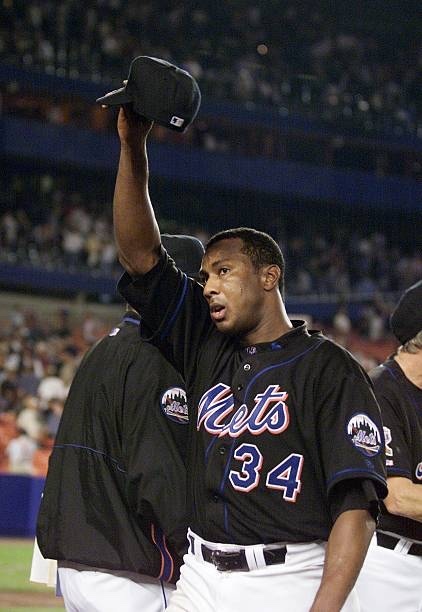 He went 15-13 in 38 games with a 5.20 ERA, pitching 228.1 innings over his two seasons with the Mets. His numbers aren’t a great indication to the gamer he was when he took the mound at Shea. Astacio would go 129-124 throughout a 15 year career, pitching 2196.2 innings while sporting a 4.67 ERA and 25.7 Wins Above Replacement (WAR).